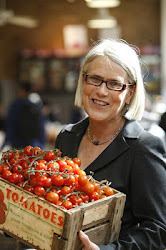 Darina Allen: The excitement builds for LitFest (and a giveaway). The excitement builds for LitFest (and a giveaway). Only a day and a half to go until the LitFest kicks off. There's a frenzy of activity everywhere. Make sure you read to the end because I have a really exciting giveaway for you! I've just been over to the Big Shed where the FRINGE events will take place, it's crazy over there. A couple of the lads are making twenty "banqueting" tables out of recycled pallets with drills and nail guns. There's a huge chandelier made out of the oak staves from the whiskey barrels. Camilla's kids corner looks so exciting with balloons, bunting and coloured baubles of all shapes and sizes - she's got so many fun things planned throughout the weekend. A barista area and several restaurants are popping up as we speak. Lolo's papier mache cow is watching in general amusement over the proceedings. The graffiti artists are in their element with acres of bare wall to adorn. I was just overwhelmed by the excitement, everyone is just having the best fun, working together with the music blasting out. And then to the main event. Stephanie Alexander has just arrived in from Australia. I met her this morning and understandably her body-clock is topsy-turvy and she was wide awake at 4 o'clock this morning, and had had breakfast and been out for a walk by the time I phoned her at Ballymaloe at 8.30. Madhur Jaffrey and her husband, Sanford, are on their way down from Dublin Airport as we speak. Several others will arrive later on in the day. Of course some events are already sold out but there are still lots of opportunities to attend events in the Grain Store and Carrigaun Room. My co-director at the festival, Rory O'Connell, thinks that David Thompson's demo here at the School and talk in The Grain Store on Thai Food are not to be missed. His name is not so well known over here as Madhur Jaffrey and Claudia Roden, though many of you will have seen him as a mentor on Masterchef 2012. I have been a huge fan since I ate at Darley Street Thai in Sydney over ten years ago, and more recently at his Michelin starred Nahm in Bangkok, and we are so excited to have him over here for the weekend. Be able to travel to Co. Cork this weekend for the event. Leave a comment below: tell us what you're most excited about LitFest, and which event you'd like to win tickets for. Entries close at 7pm tonight, Thursday May 2nd, British Summer Time. Winners will contacted by email, so be sure to choose a commenting option which provides us with your email address - these will NOT be used for future marketing). The prize is a ticket for you and a friend, for the stated event, either (Take Three Past Students (demo) or New Voices in Food (talk). Not including travel or accommodation. The gathering of the greats of the food world in an iconic setting which has contributed so much to the preservation of recipes and techniques, whilst inspiring a range of current, and future, greats. I would love to attend Take Three Past Students. I am most excited about seeing some fantastic culinary home grown talent and learning new things from them (and maybe get a taste too). I would love to attend the demonstration by your three past pupils. I am a big fan of all that is from Ballymaloe (food, cookbooks, chefs)and would love to see your past pupils in action. I would bring my mother along as she has all of your books (and Rachel's) at home and would only love to see Ballymaloe in real life. I’d love to attend the demonstration from your three past pupils. My boyfriend is an aspiring chef and food is his unwavering passion. He lights up when he’s learning about new cooking methods and recipes and watches every TV cookery programme out there. This would make him very happy and I’m sure I would reap the benefits when he takes his new skills back to our kitchen! I am excited about seeing some of the most respected people in food present in such a lovely setting as Ballymaloe, I am particularly excited about Madhur Jaffrey and the Big Shed. I would love to see Take Three Past Students. I’d love to win tickets to the festival this weekend for a very simple reason: I’d like to bring my girlfriend Alex Cashman. We’ve not been dating very long (8 weeks today) and every day I get to hear stories about her time at Ballymaloe; about Saturday Pizzas, drinking wine as homework, chopping chives and chopping the heads off chickens. It’s obvious when Alex talks that she has a massive place in her heart for Ballymaloe and I know she really wanted to go to the LitFest this weekend. I’m the reason we didn’t buy tickets as I have a lot on this month but as this weekend approaches I’m regretting not having arranged things differently. They say timing is everything and if we’d met and started dating earlier I know we’d have bought tickets and planned a big trip down. If I’d said “let’s go” then I know right now Alex would be so excited she’d be floating through today with a big smile on her face. Timing and regrets, they’ve a lot to answer for. It’s not all about Alex though - I love food too! We actually met as we both tweet about food. I have a baking blog but post inconsistently and I’ve struggled to ‘find my voice’. I’d love to come and hear from so many of the speakers this weekend so I can tap in to the wealth of knowledge you’ve assembled. I know I’d be unstoppable if I ever got started! I know I’d love the ‘New Voices in Food’ talk but as an ex-student I think Alex would prefer ‘Take Three Past Students’ so I’d like to ask for that talk if possible. Going on the Sunday would also mean we could listen to Dorothy Cashman’s talk, Old Recipe Books to Treasure, which I know Alex would love. Thanks a mil, keeping my fingers crossed! Thank you all for your wonderful entries and enthusiasm. The winner of Take Three Past Students is Andy, the baking batchelor. I am an old romantic at heart, and love your story. And it'll be a great opportunity for Alex to visit us again and bring alive all her favourite places with you. And the winner of the New Voices in Food is Maire, delighted to be welcoming a local to the event, I hope your kids have a ball over the weekend. I do hope we will see the rest of you over the weekend too! Sorry, Genevieve - I was very touched by your entry. It would be great to see you there at LitFest anyway - there are so many free events and plenty of tickets still available.It promises to be a feast of a weekend. Online assignment help services by Sample Assignment has been trusted by many students worldwide for over a decade. SA providing assignment help to students struggling with their assignment tasks given by Universities. Whether it is an essay, dissertation, case study, accounting assignment help or any other form of assessment, you can trust us for 100% original and plagiarism free content by which get HD Grades. An Australian assignment provider such as Sample Assignment, is well-known for its 24-hour online assistance on the WhatsApp platform. Students can reach out to us with their queries at any point of the day or night and get the most effective solutions for them. Our best online assignment help experts talk about how to select and evaluate the right academic sources, which will help you clear all your assignment-related doubts at best and affordable price. Whenever need to search for macroeconomics assignment help, our experts will be assist you.